I broke two peace signs today. First I tried to use a small scrap oak oval. It did not go well. Fragments of oak went flying around the workshop and I had to start over. 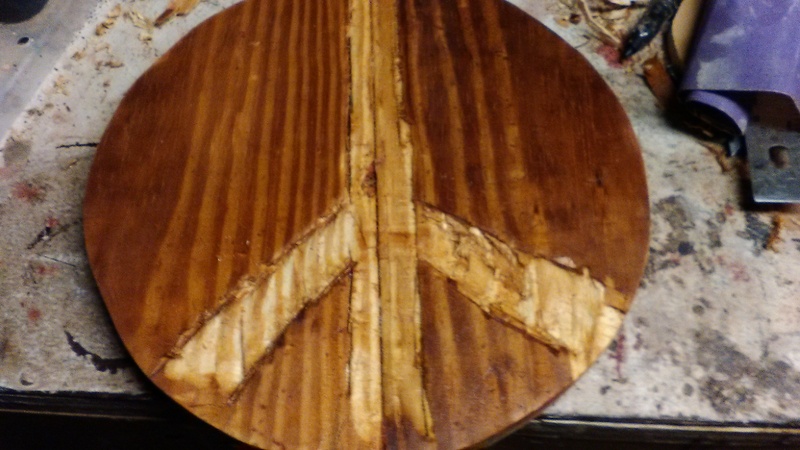 I decided maybe today isn’t a wood day so I glued some scratched CD’s together & tried to cut a peace sign out with the scroll saw. Disaster. Finally I used some oak flooring and busted out the dull chisels. Peace is a process not an outcome. 37 down 328 to go. This entry was posted in 365 days of peace, on-going projects, scrap wood by brighid. Bookmark the permalink.